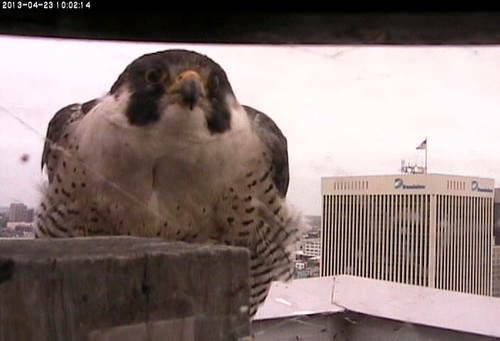 Since the loss of the eggs at the Dominion Building we have been watching the cameras there as well as at Riverfront Plaza for falcon activity. We were pleased to see the birds on the Riverfront Plaza camera on April 23rd. Since that time both the male and female have spent considerable time at the nest box and have frequently engaged in courtship behavior like the “head-low” display seen below. 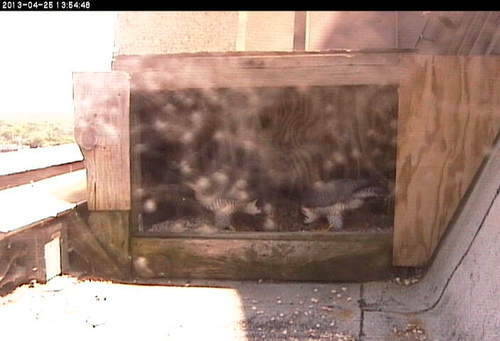 All of this makes us cautiously optimistic as we wait to see if the Richmond peregrines will attempt a second clutch.